I spend five to six months a year as a dive guide and photographer in Palau. I was always on the look out for Palau's muck dive, those weird and wonderful critters hiding in unusual places. I tried looking around inner lagoons, shallow rock islands, broken old docks but nothing seemed to have anything really really exceptional or maybe my macro skills are just not quite there yet. Don't get me wrong crocodile fish, scorpionfish, nice nudibranch’s and great little usual critters, but not the type of diving thats going to get critter enthusiasts or macro freaks packing their dive bags and heading for Palau. Of course Palau is famous for its large schools of fish, mantas, sharks, jellyfish lake and most recently spawning dives, so maybe I was expecting too much, as we all know you cant have it all. WHAT IS BLACKWATER DIVING ? Blackwater Night diving started commercially in Hawaii more than 10 years ago, and this is where we first started to gather our information to try it in Palau. The original concept consist of diving offshore in the middle of the ocean at night and jumping into the abyss. By hanging lights at around 15m for a stable reference depth and drifting over a contour of a 1000 meters or as deep as you can, microscopic zooplankton rises from the depths bringing with them an array of magical creatures. Post larval stage fish and juvenile undeveloped species come into the lights to feed, gelatinous pelagic invertebrates, jellies, comb jellies, ctenophores, pelagic gastropods and pelagic cephalopods to name but a few. Its the biggest migration of animals on the planet and it happens every night. Around one hundred million tones of bio mass rises from the mesopelagic layers (so deep that light cannot penetrate) to the epipelagic layers (close to the surface) to feed and respire on richer concentrations of oxygen. Blackwater has become increasing popular over the years. Although the original concept from Hawaii is to drift in the open ocean over as deep as you can possible get without using lights as attraction, its not always possible to get very deep water or in our case the weather is not always good enough to go offshore. Some people use lights while others prefer to drift in the darkness only by chance coming across the weird and wonderful. I personally prefer to use lights as I believe this increases our chances to see more critters. Lights attract plankton ,which attracts post larval and juvenile fish, this in turn attracts predators like cephalopods which feed upon the post larval fish. However there are many critters and creatures which will try and stay away from your beaming lights. We hang lights on a crossbar at 12m with the bottom being around 4000ft deep or deeper. We then tether people to the boat for safety reasons and drift along in the pacific ocean to see what is attracted to our lights. We also started doing Blackwater inside the lagoon and experimenting in different places. If you want to know our results keep reading. 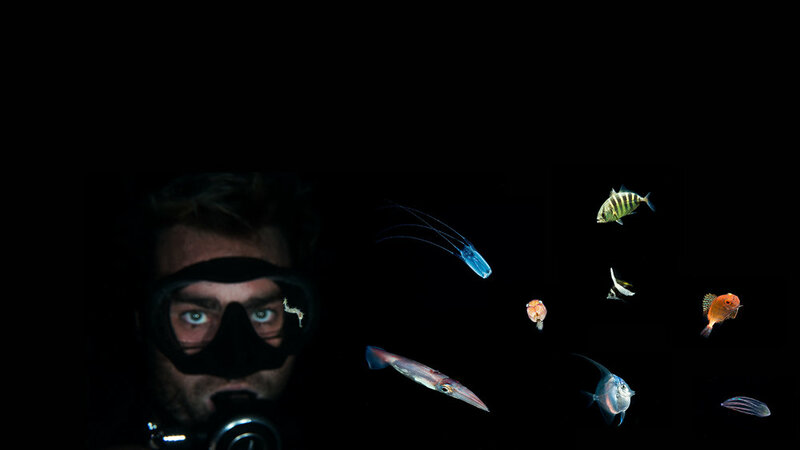 Unique Dive Expeditions were the first dive shop to start pioneering open ocean black water night diving in Palau. As apposed to placing your lights against a wall with as deep a drop off as you can get, this concept is the same as in Hawaii. Drift in the middle of the open ocean at night attached to the boat looking to see what drifts by or comes up from the depths to have a look. After taking one last sweeping look with your powerful dive light for any breaking shark fins on the surface you start descending down the line to the glowing ball of lights below. You instantly get that distinct feeling of being in space, being suspended in that dark black abyss with nothing all around is a sensation in itself. The first ten minutes is always a little unnerving, are there sharks are there not ? and then as things start drifting in from the darkness and you get your macro radar locked in, you loose your fears and the excitement takes over. The first thing that catches your attention is the school of about one hundred or more pelagic squid that are darting in and out of the lights a few meters below, we see these on nearly all blackwater dives. In the beginning it was all new to us, so we did not pay so much attention to them as they were far to fast to be able to get a good shot. We did notice however that they were hunting as we all got inked several times during the dive. We did notice however that they were hunting and not just the juvenile fish that were feeding on small crustaceans and copepods but they were also hunting each other. Throughout the dive theres action, juveniles swim into the lights stop for a few seconds and dart off, some recognizable but most you have no idea what they are with their transparent bodies and visible backbones. As the dive unfolds an array of miniature jellies are drifting all around us in various shapes and sizes, colours pulsating and flashing as they look for their prey of microscopic zooplankton. If you look close enough you can see even more creatures becoming visible as the show just gets started. A whole new world it seems has just opened up, shrimps and crustaceans are using jellyfish as transporters, like hot air balloons or space ship captains as they drift by in the open abyss next to you, hiding from predators yet scouting for food in their own symbiosis. 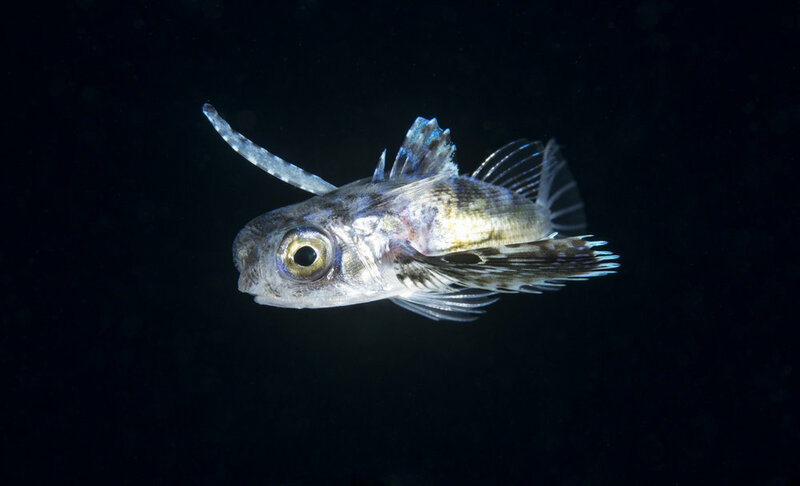 Once pelagic fish larvae are now becoming juvenile reef fish and undergoing mutations and dramatic changes to their bodies as they begin to be drawn closer to the reef and their next stage of life. A typical example of these mutations are flounders, once settled flounders are bottom dwelling fish that have their eyes on top of their head. During their open ocean phase their eyes are either side and they swim sideways to capture their prey. As they mature and are drawn closer to the reef, one eye will start to migrate through its body and eventually join its other eye now both on the same side and ready to become an adult bottom dwelling fish. Every night we do blackwater its different. Some nights have more jellies, some nights more juveniles. In the beginning we had no idea, but like the spawning dives we started to realize that blackwater diving is also connected to the moon, or in Palau at least. When the moon is full and at it’s most powerful, creatures seem to be hiding from the likes of predator’s, maybe organisms are still there but much deeper. When the Moon is approaching it’s New Moon cycle or black moon and there is little or no ambient light, everything is seems to be out. On May 2015 during one of our Blackwater dives on the East Coast of Palau we came across one of the white rhino's of Blackwater diving something called a Paper Nautilus. It had only been a few weeks earlier after reading an interview from one of the photographers from Hawaii talk about how he had been longing to see one. Until that day I had never heard about one before and I could not believe my luck as I looked under a piece of drifting sea grass to find one staring right at me. You can imagine my excitement as bubbles started appearing estatically from my regulator. The reason I was getting so excited is because a paper nautilus is a pelagic octopus. It spends its entire life drifting in the open ocean and few divers have ever witnessed seeing one. This was the first ever recorded and documented observation of one in Palau and possibly Micronesia. My luck was not to stop there as two weeks later I tried doing a blackwater dive on the west coast of Palau. I am always trying new places. And to my surprise we encountered another one also drifting by on a piece of sea grass. It just goes to show always take a second look at something you might think is ordinary. If I hd not gone to inspect the piece of Sea grass I never would have know they were in Palau waters. To do open ocean blackwater diving, weather conditions have to be near perfect. Not just the size of the waves but more importantly how fast the wind blows or drifts the boat. You don’t want to spend all your time swimming after the boat or worrying about drifting away, thats just not fun or safe. We were having a run of bad luck with the weather and many blackwater dives were having to be cancelled. We needed to find an alternative, somewhere with constant shelter if we were going to continue offering this type of diving regularly.We thought we would experiment inside the reef but still a place with a good drop off and some depth. We followed the same procedures, hung lights and waited thirty minutes. Even though the depth was considerably shallower, the results were outstanding. Nocturnal creatures that were usually extremely hard to find were coming out from the daytime hiding places and hunting in the lights, reef dwellers, sand dwellers all sorts of juveniles, that had recently made their way back to the reef and settling in their new habitat were drifting all around us. Doing blackwater inside Palau’s sheltered reef made us realise you don't necessarily have to drive for hours offshore to do something similar to open ocean blackwater diving. Every place you try whether it’s a wreck, reef, drop off, wall or shallow sandy bottom, might just have something unique and special hiding in the daytime that might be willing to come out at night to see whats around, you must also understand you might get nothing at all. Next time you do a night dive, try shinning your torch into the blackness, give your eyes a few minutes to adjust and see what is drifting by. You might be very surprised to find some magical creatures that are out there in the darkness just waiting to be photographed.